When I was a kid, I had several idols I wanted to emulate. There was first lady Nancy Reagan, who ran the “Just Say No” campaign; Grace Van Owen, the cool female attorney from “L.A. Law”; glamorous Miss America; and any one of the Dallas Cowboy cheerleaders. As I grew up — thankfully — my idols changed in regard to proximity. Currently, one of my favorite people is La Mesa Fair Trade co-founder Anne Pacheco. A board member of the Global Solidarity Commission, Interfaith Council of La Mesa, Fair Trade San Diego County and a CRS Ethical Trade Ambassador, Anne has the kind of heart with which I wish we were all born. When I first met Anne several years ago, I was editor of La Mesa Courier. She and Nancy Ryan, her partner in Fair Trade, were seeking publicity for their efforts to spread the news about fair trade. For those of us who don’t understand fair trade, it is a movement that promotes paying people around the world a fair, living wage for their work. Many people in developing countries struggle daily to provide for their families, working to make ends meet by accepting low-paying jobs with unhealthy working conditions. People in these countries often contend with forced child labor or human trafficking, circumstances that have the greatest impact on women. Thanks to Anne and Nancy’s efforts, St. Martin of Tours Academy, where Anne works as an administrative assistant, was designated a Fair Trade School, making it the first elementary school to achieve such a designation. Fair Trade Schools promote social justice, environmental sustainability and economic empowerment for fair trade producers, workers, artisans and their families, according to the academy’s website. If you know Anne, it’s no surprise this cause is near and dear to her. She is the first to ask after a person’s well-being and the last to say anything hurtful. She is also always looking for ways to help. After she read my column on purchasing a gift card for a mother and her two children, she gave me several copies of a small flyer to keep in my purse for those kinds of moments. The paper offered information about where people can go for food, showers and shelter. “I try to always hand these out when I meet people in need,” she said. 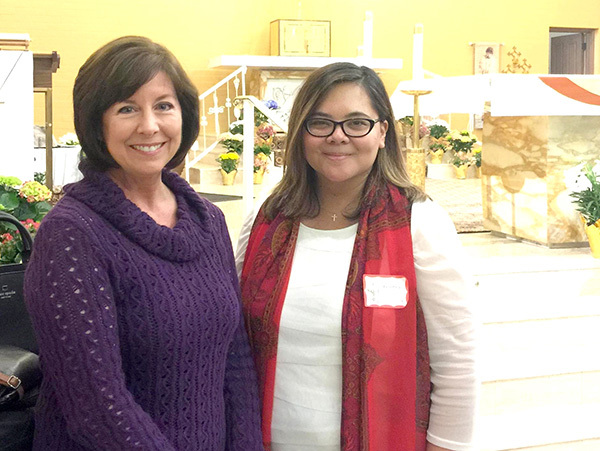 Another good Samaritan project with which Anne is involved is Build a Miracle, a ministry that gives parishioners a chance to live out their faith by doing something for others. Specifically, she and her husband, Mark, have helped Miracle workers build three homes in Tijuana. When I was a kid, my idols were celebrities seen only on TV. As an adult, I’m happy to count Anne as one of my inspirations for how to live in La Mesa, the United States and the world. Heaven knows this world could certainly do with more Annes living in it. Join Anne and Nancy at the annual Fair Trade Gift Faire in La Mesa Oct. 14 from 8 a.m. to 1:30 p.m. at St. Martin of Tours Parish Hall. The largest gift fair of its kind south of Los Angeles, the event features handmade baskets, jewelry, purses, bags, scarves, toys, Christmas ornaments, coffee, tea and chocolate. Vendors include All Across Africa, Around the World Gifts, Ben & Jerry’s Fair Trade Ice Cream, Café Moto, Equal Exchange, Divine Chocolates, Fair Trade Décor, Dr. Bronners, Genesis Fair Trade, The Golden Rule, The Guatemala Project, Malia Designs and Threads Worldwide.